The owner of a family-run nursery in Hampton Park fears the possibility of closing his doors if a major roads authority does not play fair. 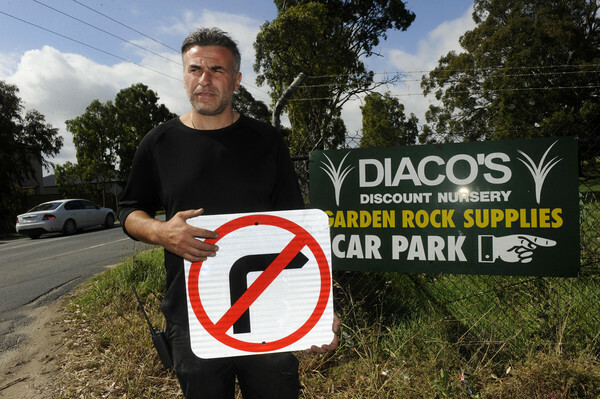 The State Government’s Hallam Road Upgrade – which will add an extra lane in each direction between Ormond Road and South Gippsland Highway – will involve the compulsory acquisition of land at the front of Diacos’ Family Discount and Garden Rock Supplies. Anthony Diaco, who manages the business with his father Vince, spoke to Star News last year with his concern about a right-hand turn into his business being removed as part of the roadworks. He said his business, which depended on 400-600 deliveries a week, would be inconvenienced by having to conduct de-tours. “There’s no dialogue anymore,” he added. Adding to his frustration is the speed limit on Hallam Road will be increased from 60km/h to 80km/h. According to MRPA, improving safety was a key priority for the project as 22 crashes on Hallam Road were recorded since 2012. “The newly upgraded road environment along with high usage by heavy vehicles and limited entry and exit points along this route warrant a revised speed limit,” an MRPA statement said. Mr Diaco said the loss of the right-turn would also see a drop in customers. “There’s no way I would’ve invested this money, I would’ve relocated because access it’s very important for this business,” he said. “We’re installing new traffic lights to help drivers safely turn in and out of Hallam Road or Evans Road and the South Gippsland Highway,” he said.